Canada moonseed, menispermum, yellow parilla, Texas sarsaparilla, yellow sarsaparilla, vine maple. Moonseed is usually found along streams in woods climbing over bushes, its range extending from Canada to Georgia and Arkansas. 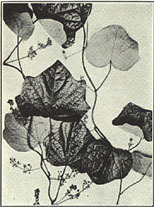 This woody climber reaches a length of from 6 to 12 feet, the round, rather slender stem bearing very broad slender-stalked leaves which are from 4 to 8 inches wide, roundish in shape, an] resembling the leaves of some of the maples. In July the loose clusters of small, yellowish or greenish-white flowers are produced, followed in September by bunches of black 1-seeded fruit, covered with a bloom and very much resembling grapes. The rootstock, collected in autumn. prev: Maypop. Passiflora incarnata L.
next: Mullein. Verbascum thapsus L.